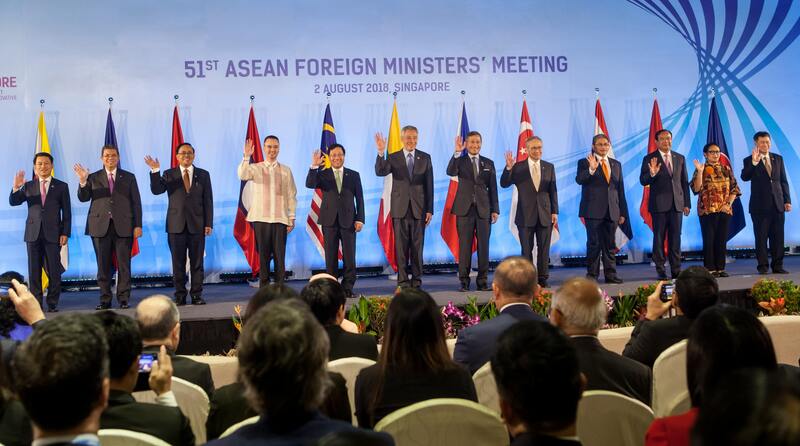 SINGAPORE — The escalating trade war between the U.S. and China has prompted the Association of Southeast Asian Nations to call for accelerated negotiations on the Regional Comprehensive Economic Partnership, a free trade framework involving ASEAN and six partner countries. On Friday, ASEAN foreign ministers held meetings with their counterparts from India, South Korea and Australia — all of which are RCEP partners. "With the imminent conclusion of RCEP, we will further strengthen the trade between ASEAN and Australia," said Myanmar’s Union Minister for International Cooperation Kyaw Tin, who chaired the discussion with his opposite number from Canberra. This followed a joint communique issued by the bloc on Thursday, calling for "the swift conclusion of the RCEP negotiations and achievement of [a] modern, comprehensive, high quality and mutually beneficial agreement." But a number of contentious issues are yet to be agreed, not least India’s reluctance to further open its market to Chinese imports, raising questions over how quickly a deal can be reached. The bloc’s ability to persuade its partners to move in the same direction will be crucial to reaching an agreement. The statement described RCEP as a priority, "particularly at a time of growing uncertainty in global trade." The ministers reaffirmed their "belief in the role of free trade and the role of multilateral institutions as a formula which has brought peace and prosperity for seven decades, especially in Southeast Asia," said Singaporean Foreign Minister Vivian Balakrishnan, the meeting chair, at a news conference. "The prospect of an intense trade war between China and the U.S. is a top concern of most Southeast Asian states," said Malcolm Cook, research fellow at Singaporean think tank ISEAS - Yusof Ishak Institute. On wednesday, it emerged that U.S. President Donald Trump had asked his trade representatives to consider increasing proposed tariffs on $200 billion of Chinese imports to 25% from 10%. "ASEAN will feel the collateral damage from the U.S.-China trade war," said Chua Hak Bin, an economist at brokerage company Maybank Kim Eng. The U.S. and China account for 11% and 13.6%, respectively, of the total exports of the bloc’s six export-oriented economies — Singapore, Malaysia, Indonesia, Thailand, Philippines and Vietnam. "Asian countries [that are] more plugged into the supply chain and export intermediate goods to China as a final processing hub will likely be indirectly hit," he said in a report dated July 25. Even in a scenario where the proposed tariffs were left unchanged at 10%, the gross domestic product growth of both Singapore and Malaysia would be pushed down by 0.3%, according to an estimate by Oversea-Chinese Banking Corp. Some ASEAN countries may see a partial benefit in finding alternative destinations of trade and investment to China, but that was "not enough to ease the fears," according to Cook. Amid the growing tide of protectionism, ASEAN leaders are intent on pressing ahead with the trade liberalization the bloc has been spearheading. But a common worry is that the trade war might "slowdown the effort," commented one diplomat in the region. "As a result of the growing trade tensions between the U.S. and everyone else, trade deals like RCEP ... have received additional urgency," said Deborah Elms, executive director of the Asia Trade Centre. "At a time of unsettled trade, locking in trade rules makes more sense now than ever before." At the opening ceremony of Thursday’s meeting, Singaporean Prime Minister Lee Hsien Loong said that ASEAN countries were "redoubling" efforts to conclude RCEP negotiations "by the end of the year." Many observers, however, see a completion in that time frame as unlikely, as the 16 countries — the 10 ASEAN members and its six dialogue partners: Japan, China, Korea, India, Australia and New Zealand — have yet to come to an agreement. Finding common ground with New Delhi is believed to be the biggest stumbling block, as the Indian government is reluctant to reduce tariffs on goods out of fear that it would lead to a flood of Chinese imports. India is also pushing for service liberalization, which ASEAN has yet to agree to. "[Trade tensions] could assist the RCEP negotiations by increasing China’s interest in RCEP, which has not been as strong as is often reported or suggested," Cook said.